I've been keeping track of all your great questions so I can answer them on the blog. Here are the latest! Question 1: Is white wine vinegar vegan? I’m no wine expert, but I reached out to the folks at Barnivore who said white wines tend to be vegan, but not all. Whether or not a white wine vinegar is vegan then, would depend on if the wine used to make the vinegar was vegan in the first place. I imagine you’d have to do a little research -- track down the company, see what wines they use, find out if those wines are vegan. If you're wondering "wait! how can wine not be "vegan" it's made from grapes?" it's because eggs and other animal parts are sometimes used in the process of making wine. As an alternative, rice wine vinegar is a decent substitute in most recipes and mirin might also work. Question 2: Do you recommend a vegan "ice cream like" dessert? The ones at the store are too high in fat. I can't think of any store brands that are low in fat (but there are so many options I might be missing one.) If you want a lower fat or lower calorie vegan ice cream, you'll need to DIY. The easiest, and quickes, is HH's Instant Banana Ice Cream, which is fat-free. Question 3: What are good vegan snacks? I'm not sure if you mean prepackaged snacks (for a list of commercial, though not always healthy, snacks that are vegan, check out Peta's "accidentally vegan" list) or plant-strong snacks you can make yourself. If I snack, I tend to snack on fruit, raw vegetables, toast or if I'm really ravenous, a smoothie, such asHH's Green Goddess or PB Cup Smoothie. I also love baby carrots and celery but my favorite munchie is jicama sticks with a little lime juice. I also love, love, LOVE HH's Kale chips! Lately I've been making them with hot sauce, which makes them super addictive. Roasted chickpeas, such as the chickpeas in HH's Chickpea Tacos, are also great. Muffins are also portable. Question 4: How long can I keep rice or quinoa once it's cooked? I've read that cooked grains, stored in an air-tight container in the fridge, can last up to two weeks... but I'm far too scared to eat anything that is that old (especially considering my recent bout with food poisoning). I'd say ditch it after a week. I do like to cook in bulk, but I'm careful to estimate what I need to prevent spoilage and waste. After a week or two, you'll be aware of how much you eat, or how much you don't. One of the great things about quinoa is that it cooks in 15 minutes -- so I find I rarely need to make it in advance. I usually just let it do it's thing on the stove while I work on the other parts of dinner. Put it on the stove first, as soon as you get home, and it'll be ready for serving! As for brown rice, a great (but not required) tool is the mighty rice cooker. I spent a little extra money to get one that has a special brown rice setting and a timer. Often I’ll put rice in after dinner, or before bed, and set the timer so it’s ready when I wake up (I love rice at breakfast) -- or I set it in the morning before work so its ready for dinner. It’s like a crockpot for rice. Speaking of rice cookers -- you can cook quinoa in them using the “white rice” setting! Question 5: Do you prefer using store bought applesauce or homemade? It’s not that making applesauce is hard; it’s actually quite easy, it just takes more time and I have to dirty my blender or food processor. What can I say? I’m a gal who loves easy. Making your own applesauce is a piece of cake and a great thing to do if you prefer fresh foods, or run out of applesauce, or its apple season and you have a lot of apples! 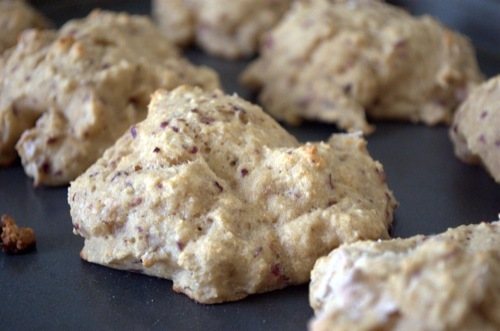 Now that you have applesauce--try HH’s 3-ingredient applesauce biscuits! If you have a question for me, leave it in the comments or email me lindsay@happyherbivore.com. If you'd like to send in an anonymous question, use the contact form in the top right corner. Thanks!